The T3 Bandage provides a multifunctional solution to a wide range of injuries in a compact package. While enhancing the treatment of conventional wounds, abdominal and large wounds, amputations, entrance/exit wounds and more, the bandage allows cleaning, packing, coverage and compression of single and multiple wounds. This all-in-one bandage reduces the amount of equipment military personnel carry and is suitable for first aid combat emergency kits. The bandage is easily applied by untrained personnel and makes an ideal personal field dressing for every soldier. 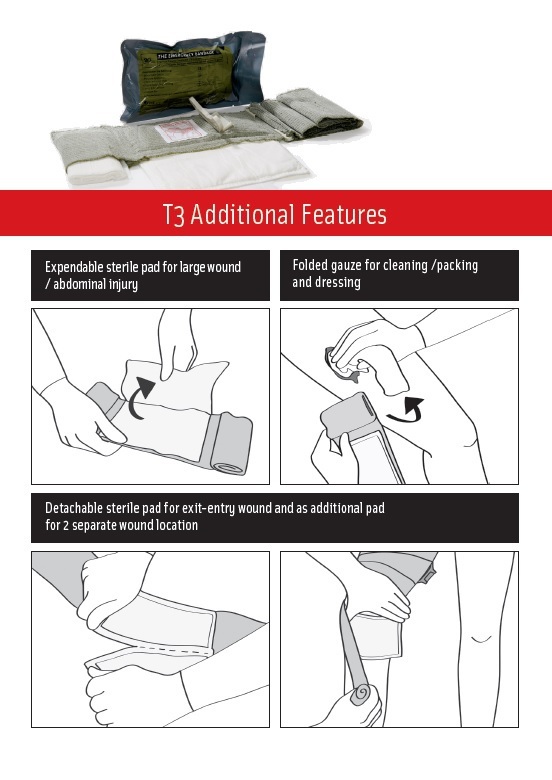 The T3 Bandage features a fully expandable and detachable large sterile dressing pad, and elasticized cloth leader, an easy to use closure bar and an extractable gauze for cleaning/packaging and secondary wound dressing. First Care's emergency Israeli bandages are the best bandages in the world, produced in Israel for the American military. They are developed and manufactured as innovative first-response medical products to improve field hemorrhage control and to save lives. These bandages have been adopted by military and civilian organizations worldwide. I was skeptical about the size of this bandage. I received this product and was able to insert it into my ankle IFAK. the bandage fits well into the small pocket of the ankle IFAK and does not protrude or "print" to where anyone could notice that I'm carrying it. I highly recommend this product to anyone but especially anyone who is limited on carrying options. This product is essential to complete the process of stopping massive hemorrhage. I cannot say enough how important it is that you consider carrying one of these. This review should be read with the understanding that I have not opened or used the product, nor will I until an unfortunate accident calls for it. With that said, the package is perfect for an IFAK or other small kit. It is vacuum sealed in a very sturdy wrap that has easy tear slots all the way around it. It also has instruction printed on the package should you forget how to properly use it I also has a wide range of feature that makes it very versatile. I would recommend this for any emergency kit. Top Notch and Cutting edge! Top of the line and great innovation and updating. Between this and the Oales they are a compact way to have a number of different pieces of gear with you for that just in case scenario! I highly recommend!!! This is the same great bandage but with an additional pad that can be separated for treating an entrance and exit wound and additional gauze for packing the wound if needed. The package is only slightly thicker than the original Israeli bandage. One package is nice instead of having to carry a separate package of gauze. This has replaced the original Israeli bandage that I carry on duty in my cargo pocket while working and in my EDC bag. I've become a huge fan if Israeli bandages. The new T3 gives you even more flexibility in its use and deployment.